Since 1972, our staff has been meeting the display requirements for sports and athletic events, for industry, and for commercial advertising. viviLED has consistently demonstrated its engineering leadership through its use of state of the art display technologies, starting with incandescent lamps to retroflective displays to today’s impressive light emitting diode (LED) video displays. Our worldwide customer base includes an ever growing list of customers using our full color, bi-color, and monochromatic LED displays. Our displays and our staff’s extensive technical background have been used at 3 different Olympics Games; Montreal Olympics in ‘76, Los Angeles Olympics in ’84, and Atlanta Olympics in ‘96. Other notable permanent and temporary installations include numerous USA and International Championships, in events ranging from football, baseball, basketball, all the aquatic sports, to downhill skiing, figure skating, equestrian show jumping (for 30 consecutive years at the number one rated facility in the world), and all other sports. 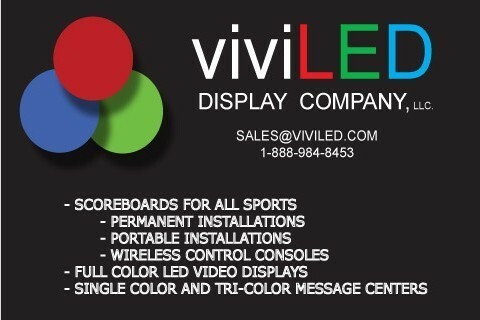 viviLED Display Company; supplying the solutions for your LED sport scoreboard, LED video displays and message center displays needs.